On the 30th of April, Massachusetts voters will have the opportunity to choose the Democratic and Republican general election candidates to succeed John Kerry, now US Secretary of State, in the US Senate. Two US Congressmen, Steve Lynch and Ed Markey, are battling it out for the Democratic nomination; three Republicans, former US Attorney Michael Sullivan, Massachusetts State Representative Dan Winslow and ex-US Navy Seal and businessman Gabriel Gomez, are seeking the GOP nod. Polls show that Michael Sullivan leads his two rivals, while Ed Markey is currently the Democratic frontrunner. An ocean away here in Ireland, however, I will be casting a ballot for a man who’s been an underdog his whole life, Steve Lynch. He’s been my US Congressman – even though I’ve been living abroad – since 2001 and I’ve been proud to cast a ballot for him in that first election and in every election since. Steve Lynch has a compelling life story to tell. Born to working class parents, he was brought up in a South Boston housing project. These affordable housing projects have been made famous, and even glamorized, by a string of movies about the Boston Irish criminal underworld. In reality, South Boston’s projects were identified in the late 1980s as being the epicentre of white poverty in the US. As such, when he hears about the struggles of the working class and the working poor, Congressman Lynch doesn’t sympathize. He empathizes. And he’s never forgotten where he comes from. Steve Lynch became an iron worker, like his father, and ultimately rose to become a leader of his union. He earned a college degree, at night, from Wentworth Institute of Technology in Boston and eventually graduated from Boston College Law School. After practicing as a labor lawyer in Massachusetts and New Hampshire, he ran for state representative from his native South Boston in 1994. I remember following that campaign, against an incumbent from a large South Boston family, very well. Long before South Boston was gentrified beyond almost all recognition, there was a clear socioeconomic and cultural divide between those who lived in the projects and those who lived elsewhere. Steve Lynch, a native of the projects, overcame the divide and upset the incumbent. And the very next year, when the legendary, long-time President of the Massachusetts State Senate, William Bulger, resigned to become President of the University of Massachusetts, then-State Representative Lynch defeated William Bulger Jr. to become South Boston’s state senator. In this capacity, and as a proud Irish American, he hosted Southie’s annual St. Patrick’s Day Parade political breakfast for several years. Just six years later, after the passing of Congressman Joe Moakley, Steve Lynch ran to represent what was then the 9th Congressional District in the US House of Representatives. Complex questions were raised about whether a “Southie guy” would be well-received in the district’s close-in suburbs (like my own East Milton), more affluent towns and hardscrabble cities. Without in any way betraying or denying who he is, he won 50% of the vote in the Democratic primary, prevailed in the general election and has been re-elected on each subsequent occasion. 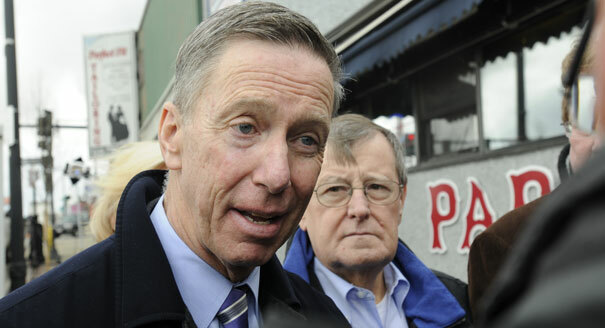 Since going to Washington, DC, Congressman Lynch has stayed true to his labour union and South Boston roots. He has fought for the interests of people who work with their hands for a living and questioned the wisdom of so-called “free trade” deals that have torn apart the lives and livelihoods of millions of Americans; he has championed the interests of military veterans; and he has helped to repel Republican efforts to “reform” Social Security and Medicare. What’s more, even though he works in Washington, DC, Congressman Lynch and his wife are raising their family in South Boston and he is a regular presence there, as well as throughout his congressional district. Steve Lynch’s opponent, Ed Markey, is a fine man and an excellent congressman who has accomplished much in his lengthy tenure in the House of Representatives. On a wide array of progressive causes, he has been to the fore and has earned a broad following. This may account for the fact that he has garnered the support of many prominent national Democrats in this primary campaign. He would be a fine US Senator. But he is no Steve Lynch. Steve Lynch’s story – a kid from the Southie projects who becomes a union leader, attorney, state legislator and US Congressman – is living testimony to the fact that what might seem impossible remains possible in America. That’s why, and regardless of where he stands in the polls a month from primary election day, I still think Steve Lynch can win the Democratic nomination and become the next US Senator from Massachusetts. As he commented when he launched his campaign in an iron workers’ hall in Boston, “some people have said I won’t fit in in the US Senate. I think they’re absolutely right.” And I’m hopeful that the significant number of Massachusetts voters with whom Steve Lynch’s sentiment and life story resonate will send him there.